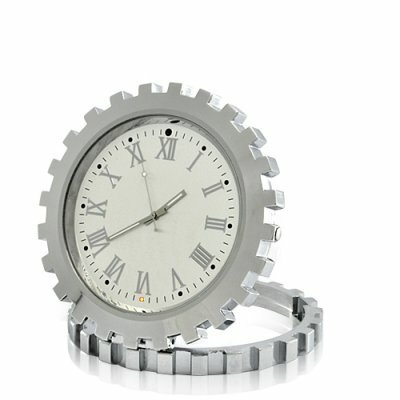 Successfully Added Undetectable HD Camera Clock with Motion Detection (4GB, Silver) to your Shopping Cart. HD Camera Clock with Motion Detection: get a permanent pair of eyes at home or in the office! ing with complete confidence requires a very discreet gadget that can be put anywhere. It is with this concept in mind that this fully functioning table-clock was designed. Hidden within the 12 o'clock time marker is a virtually undetectable high definition pinhole lens that secretly captures HD video and audio to a micro-SD card. Place it at your desk in middle of stationery, in a shelf with books and photo frames around, on a table among magazines and decorations; you are sure it will go unnoticed! This great Camera Clock comes with motion-detection activated recording. This allows you to leave the device ON and automatically record only when there is movement in front of the lens. This is the best way to catch your colleague trying to steal your stuff, or that neighbor you thought was *too* friendly with your wife... Life's really worth it to be seen under different angles, isn't it? Record (secretly) beautiful high definition video at 1280x960 resolution and 30 FPS for smooth motion capture. Videos are recorded in user-friendly AVI files directly to the micro-SD card (free 4GB included). If you are looking for a device with outstanding video quality to make sure you will recognize every single face you can't go wrong with this amazing secret recorder. Threatening to sue people is much more convincing with an ultra clear video, right? Any doubt of what's going on when you are away? Find out conveniently with this solid yet fashionable Camera Clock! It is brought to you at an unbeatable price by your reliable source of secret agent gadgets, Chinavasion.